After dreaming of Paris and the Eiffel Tower for more than half my life I got to experience the city, and kiss a handsome man at the tippy-top of the tower. As much as I want to gush about how romantic the whole scenario was, I can’t. It was romantic in the sense that everything is butterflies when you are in a new relationship, but voice on the loud-speaker warning us to beware of pickpockets was kind of a buzz kill. In fact, a lot about Paris was a buzz kill. Like the price of wine. That adage about wine being cheaper than soda might be true in other parts of Europe, but not Paris. And I may be totally biased, but none of the expensive wine I was drinking could compete with the cheap Italian wine I can get at home. Total fail, Paris. One way Paris did not let me down: the cheese sauce. The restaurants served it with red meat and fish and it was divine. It was both creamy and pungent. Yum. Oh yeah, and the Creme Brule, I ate two a day. 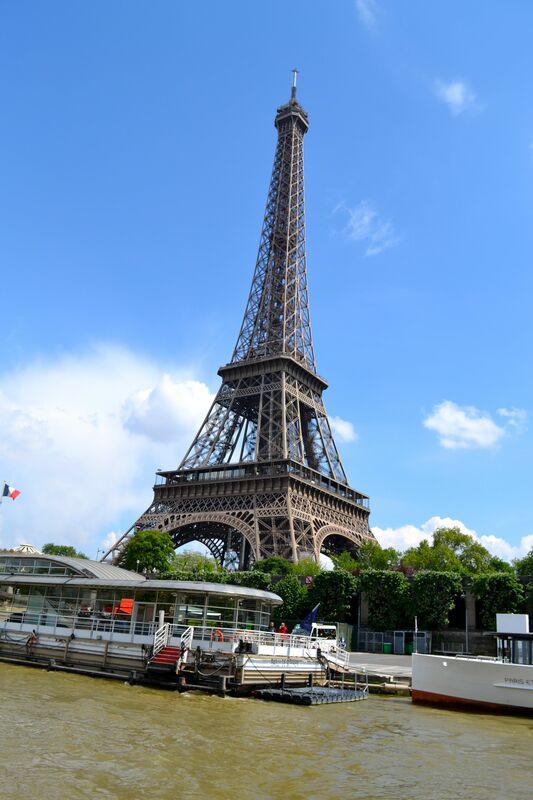 I’m surprised that I didn’t feel at home in Paris since I had dreamed and plotted about it for about twenty years…. but I just… didn’t. It is not my city. But it is the city where I got to kiss a handsome man way up in the sky, so overall, not bad, Paris. This entry was posted in Uncategorized and tagged 35 Before 35, France, Paris, Travel. Bookmark the permalink. Sorry to hear that. Could be because of the build up in your mind. I never had an interest to go to Paris but happen to have a week off in EU a few years ago and when just for the hell of it and Loved it! Try something different you have not dreamed of like Prague. I was totally blown away by Prague and had hardly even ever though of it. Sometimes when your listening for the angels harps and all you hear is traffic its hard. I totally agree that the build up was probably the reason for the let down. On the flip side, I never gave Lisbon a single thought until my friend wanted to go so I tagged along with no expectations. I think about that city every day now! I want to explore every corner of that amazing place! For cheap wine you need to go to Bordeaux! Thanks! We are going to Provence next month, do you think there will be cheap wine there? I know exactly what you mean about Paris, I felt the same when I visited. But congrats on ticking off a fantastic item from the list! Lovely!